Do u know about all those surprises which are capable of presenting processors with the micro-architecture intel core? They are sold already sufficiently long time ago, and everyone with the impatience waited for the appearance Of conroe on the counters stores. we had published numerous articles, which demonstrate the power of new new desktop CPU as families core 2 Duo and Core 2 Extreme. Today for us there is chance to meet the new core, built on the basis of the micro-architecture core â€“ Of allendale, which will be used in the series products only in the following year. But first of all let us recall from the beginning, with what arguments operate the today AMD worshippers , which are attempted to prove that the micro-architecture K8 can somehow compete with processors intel core 2. We will not assert that all these reasons are without foundation partly valid. Actually first dual core processors athlon 64 X2 today it is possible to purchase more cheaply than Core 2 Duo. Low-end dual core processor AMD cost (according to official Price) $152, while prices of Core 2 Duo begin from $183. Although thirty dollars do not seem influential argument. Secondly, the overclock Of core 2 Duo, especially low-end models in this rule requires serious approach to the selection of those completing, which will be used in the system. Only in this case the owners of systems on the base of new CPU from Intel can open entire placed frequency potential of their processors. The matter in the fact that contemporary CPU by the micro-architecture core require the frequency of frontal system bus in 266 MHz already in the normal mode that together with the sufficiently low default frequencies of these CPU. As a result, with their overclock the frequency FSB frequently must move far form 400 MHz, but only a few motherboards are capable to manage. Another problem consists in the fact that so significant increase in the frequency of system system bus requires high memory frequency, since the most motherboard LGA775 systems, iP965, does not propose the reducing dividers for the frequency of memory. 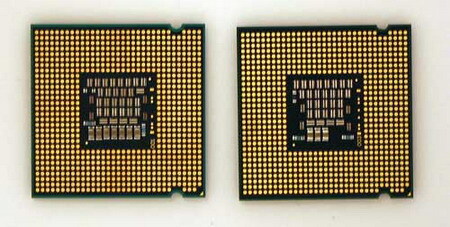 For example, to overclock a low-end processor from the family core 2, Core 2 Duo e6300 with a regular frequency of 1.86 GHz and a multiplier equal to 7x, to 3.5 GHz (that, generally speaking, is possible to consider as the completely accessible result for CPU on core conroe), is required to increase the frequency of system bus FSB to 500 MHz and frequencies of the system bus of memory (on chipset iP965) to 1000 MHz. But not every motherboard are capable to such exploits. Therefore, many overclockers, which do not desire to bear the additional financial expenses, necessary with the purchase of the expensive motherboards and DDR2 memory, are forced to be limited with modest overclocking results. To the happiness, the main object of todays story - future core allendale, will capably free economical enthusiasts from the excess headache. The promising processors core 2 Duo, in which will be used this core, had to gladden us not only lower price, but also by simplified process of overclock. Thus, the core allendale â€“ is this in all derivative of Conroe, which is characterized by the volume of cache in the second level reduced to 2 Mbytes. Moreover, reduced precisely at the physical level. 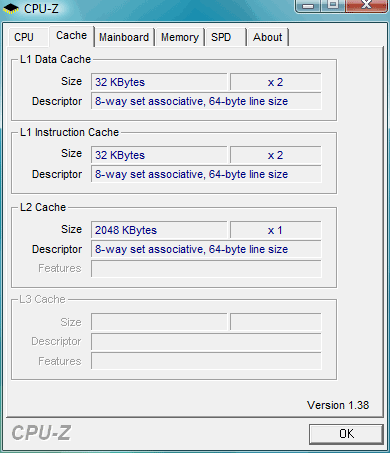 Those used at present in the low-end processors core 2 (which are equipped L2 with cache capacity of 2 Mbytes) cores are based on the valuable crystals conroe, in which half of the existing 4- mega-byte cache simply is disconnected. Next year Intel, obviously, is assembled to use the more economical approach into processors core duo and the core conroe will go exclusively into the elder models with the cache volume of 4 Mbytes. Other differences, besides the size of cache, Allendale from Conroe do not have. They will be produced on one and the same technological process and will be similar both on the electrical and according to the thermal characteristics. The cache of the second level occupies approximately 60% of the core area of the contemporary processors core 2, produced on the technological process with the standards of 65 nm production . Accordingly, the simple decrease doubly the number of transistors, used to the realization of the cache of the second level,which will make possible to obtain approximately 20- percent savings in the prime cost CPU. It is obvious that the core Of allendale gradually will move to the accessible on the market processors core 2 Duo e6400 and E6300, the cache of second level of which is reduced to 2 Mbytes. Allendale in the near future on the market will appear as entire new series CPU core 2 Duo e4000. The basic special features of this rule they will become the obviously reduced to 2 Mbytes L2 cache and the 800-mhz system bus quad pumped. the family of processors for the desktop computers with the micro-architecture core will be enlarged giving possible to feel all strong sides Of core 2 and in the systems, which exploit the more accessible frequency FSB 200 MHz. At the given moment is known about three promising representatives of core 2 Duo with the 800-mhz system bus . First, during January 2007, will appear Core 2 Duo e4300 with a clock frequency of 1.8 GHz, and in the second quarter of next year it will be joined processors with the ratings Of e4400 and E4200, whose default frequencies will be equal to 2.0 and 1.6 GHz respectively. During this day Intel plans to begin sales of the first processor, based on the core allendale, Core 2 Duo e4300. And although before this major event remain more than a month, the model of processor indicated appeared in our test laboratory. First of all give let us focus attention on the special features of this processor. For this let us compare the exterior view .the Core 2 Duo e4300 and already well familiar to us the processor core 2 Duo e6300, which is been until today lowest-end CPU from core 2 for in desktop computers. Differences are revealed on the abdomen. Attached elements in Core 2 Duo e4300 are located entirely differently. As u see, any concealed differences, besides perhaps the absence of support to the technology of virtualization, in the processors of series e6000 and E4000 will not foresee. But therefore, simply let us put Core 2 Duo e4300 in motherboard and we will look how it will be identified by utility CPU- Z. If all above-mentioned is read attentively, then image on the screen shot hardly can shock. It is desirable to note only two things. First, CPU- Z incorrectly determined the voltage of supply of processor core, this is not in any way connected with the properties Of allendale. However, the regular vcore of our core 2 Duo e4300 was equal to 1.325 v. secondly, attention should be focused also at the new value CPUID, for the core allendale it will be equal to 6F2, while CPU based on present core conroe, have CPUID=6F6. Processor core 2 Duo e4300 support the technology enhanced intel speedstep, reducing in the periods of idle its multiplier to 6x and frequency to 1.2 GHz. Thus, as a whole CPU new series Of e4000 must prove to be somewhat more economical than e6000, for which minimum frequency is equal to 1.6 GHz. The Relatively high multiplier (although it is fixed), the same as in Core 2 Duo e6600, will allow to overclock promising cpu to the maximum on many motherboards, without coming to the services of overclocker memory module. It remained only to be convinced on the fact that this is not the full frequency potential of core allendale. For checking we gathered the test system, in which besides the processor Of core 2 Duo e4300 and motherboard ASUS P5B deluxe, based on iP965, it was used 2 gig DDR2 operational memory mushkin XP 2-6400PRO (with latency 4- 4- 4-12), video card powerColor x1900 XTX 512MB and hard disk western digital WD1500AHFD. 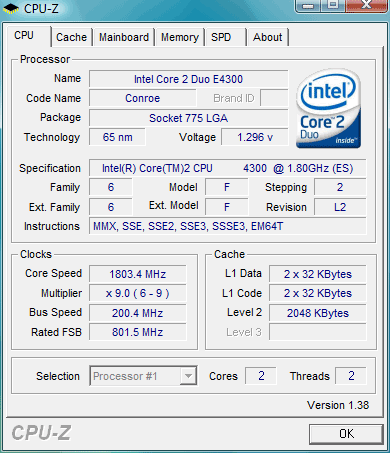 For the beginning we decided to look, to what frequency is possible the overclock Of core 2 Duo e4300 without any change, i.e., without increasing the vcore voltage, and using only standard cooler. Under such, generally speaking, unfavorable for overclock conditions the frequency of system bus was possible to be increased to 325 MHz. In this case the system preserved complete stability, what was checked by half-hour runing two copies of the utility prime95. Thus, to 2.93 GHz our processor was overclocked. But this is, between the frequency Of core 2 Extreme x6800, elder from CPU based on the core Conroe. After increase in the vcore volatge to 1.45 v the result of overclock was improved. It is obvious that the core allendale as Conroe reacts well with overclocking to increase in the voltage. Without the loss of stability in this case the frequency of system bus was possible to raise to 352 MHz, which allowed processor to work at frequency in 3.17 GHz. However, for more overclock the processor just refused.After overclocking the system and using intel thermal analysis tool, we saw that the core of processor (according to the data of the built-in in them digital sensors) are in the temperature of 83 degrees. So the limit here is based on the cpu cooler , further experiments were placed with the use Of zalman CNPS9500 LED. This cooling system made possible not only to reduce the temperature of processor with the frequency of 3.17 GHz on 7 degrees, but also to reach higher results. Thus, without increasing the previously selected voltage of supply in processor , we succeeded to overclock the processor already to 3.2 GHz. However, this â€“ entirely small improvement in comparison with the results obtained with the standard cooler . However, the installation of more advanced cooler will give the possibility of additional growth with the vcore volatge. Therefore, into the completion of our experiments, was decided to try the overclock Of core 2 Duo e4300 with the vcore increased to 1.5 v.
As that was to expected, the limiting frequency of processor, with which the stability of system is not lost, again increased. To this time the maximum frequency of system bus was set to 367 MHz, and the frequency of the overclocked processor grew respectively to 3.3 GHz. Thus, the processor Of core 2 Duo e4300, based on the insufficiently studied core allendale, was overclocked to 83%. From one side, result is simply shining. At least, earlier processors, overclocked more than one-and-half times. But from other side, 3.3 GHz seems insufficiently high frequency for the processor with the micro-architecture core. CPU with the core conroe in the majority of cases (with the presence of qualitative motherboard and memory modules) are overclocked perceptibly better, subjugating higher frequency limits. We should understand that even the overclocked to 3.3 GHz processor with the core alliendale will work substantially faster than any accessible today dual cores processors (with the condition for their operation in default mode :-) ). But this means that performance which it is possible to get out of Core 2 Duo e4300 with overclocking will be sufficient for any needs. 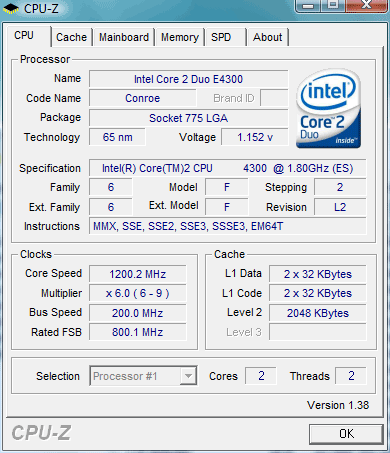 For example, this overclocked CPU obtained in Windows vista 5.7 marks. We must add that the copy Of core 2 Duo e4300 tested by us was an engineering model, therefore the results of overclock of series CPU of this model will differ to the best side. Although is possible to note : since the core allendale is aimed to the use in the cheaper processors than Conroe, Intel pay smaller attention to the qualitative fine adjustment of technological process, that also is reflected in the lower frequency potential.